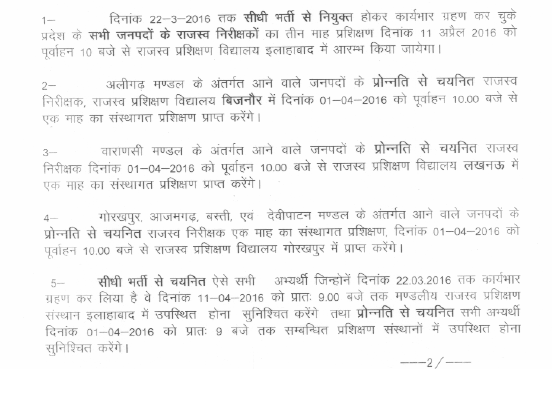 Board of Revenue (BOR), Uttar Pradesh is going to conduct Training for selected candidates of Revenue Lekhpal exam and promoted / pronnat candidates. The notice regarding this had been released by the official website. The training of Lekhpal will be done in April 2016 at Mandliya Rajaswa Prashikshan Vidyalayas. All those candidates who had qualified the written exam, will have to go through training now. The training of Lekhpal selected candidates or Promoted candidates will be held at various Rajaswa Parshikshan Vidyalaya / Revenue Training Schools of Uttar Pradesh. Lekhpal Training Schedule / dates can be checked from the below given notice. You can check the detailed notice from below given image.